Because of the Victorian London setting, an unconventional narrative, some stage illusions, and elements of gothic horror fantasy, “The Somnambulist” has drawn comparisons to the novels “Jonathan Strange and Mr. Norrell” by Susanna Clarke and Gordon Dahlquist’s “The Glass Books of the Dream Eaters”; writers Neil Gaiman and Clive Barker; and the films The Illusionist and The Prestige, the latter of which is based on a Christopher Priest novel. As is most often the case with such comparisons, they are hardly accurate and more often than not end up creating false expectations for the reader. For instance, “The Somnambulist” is a much shorter (353 pages), faster-paced and more accessible read than either of Ms. Clarke’s or Mr. Dahlquist’s hefty and verbose tomes. And while one of the characters is a conjurer by trade, the novel really has nothing to do with magic tricks, except perhaps for the story itself which is driven by deception and where nothing is at it seems. I will allow that the prose at times and some of the darker aspects of Mr. Barnes’ imagination reminded me a bit of Clive Barker and Neil Gaiman, but the author isn't nearly on the same level yet. Other than that and just a few superficial similarities, I found “The Somnambulist” to be a very singular reading experience, led mostly by the novel’s presentation. 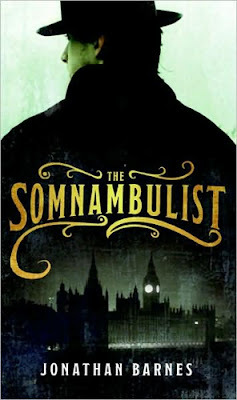 As a whole, “The Somnambulist” is an eccentric novel that partly seems to celebrate 19th century Victorian London with its numerous references while also mocking the era, whereas the story is a curious mixture of detective mystery, gothic horror, black comedy, and supernatural fantasy. In short, the formula for Jonathan Barnes’ debut is quite bizarre, and while it seems like it shouldn’t work, it’s actually very effective—to a certain point. For instance, I really liked the narrative style, the surprise twist was executed nicely, and I loved the tone of the book which beautifully blended together whimsy, grotesqueness, and intrigue. However, I thought the information regarding Edward Moon's past was sorely lacking, particularly the Clapham debacle which is frequently mentioned, the history that he shares with the prisoner Barabbas, and his relationship with a character that pops up later in the book. I was also disappointed in the Somnambulist—who was more of a secondary player despite the novel being named after him—and not learning who or what he is, where he came from, or why he befriended Edward in the first place other than some weak speculations. Another thing that bothered me was how the narrative inexplicably went from focusing on Edward Moon to including Mr. Skimpole, his boss Dedlock, Mrs. Grossmith and various other characters that weren’t quite as interesting. Lastly, once the big secret was unveiled and the Prefects made their appearance, the novel veers into standard comic book/penny dreadful fare—complete with a Frankenstein-like monster—which brought to mind Alan Moore’s The League of Extraordinary Gentlemen. Not exactly a bad thing, but it was unexpected and might turn off readers who are unable to suspend their disbelief. 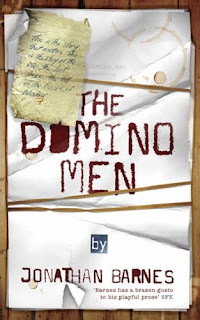 NOTE: “The Domino Men”, the follow-up to Jonathan Barnes’ “The Somnambulist”, will be released February 21, 2008 (UK only) through Gollancz Books. Actually, in spite of the problems you have with it, it sounds very interesting! So far the book has been very interesting.